Pocket is a great companion to save and organize your favorite articles, videos and more. When you save a page to Pocket, it’s available when you’re online as well as offline. This makes it the perfect tool for your travels as well as your day-to-day routine. When you’re planning a short trip or a big adventure, Pocket can help you keep organized, informed and entertained. Read on to learn more! Pocket is a great resource to plan your next trip. You can save items to Pocket on your phone throughout the day, then review them at home on your computer. Pocket syncs your List across devices, so there’s nothing to set up or configure. Plus, you can organize your saves with Tags, so all your travel research can be kept in one place. If you’re traveling with companions, you can easily share items using Send to Friend to keep each other in the loop. To get ideas and inspiration for your adventure, use the Explore page. 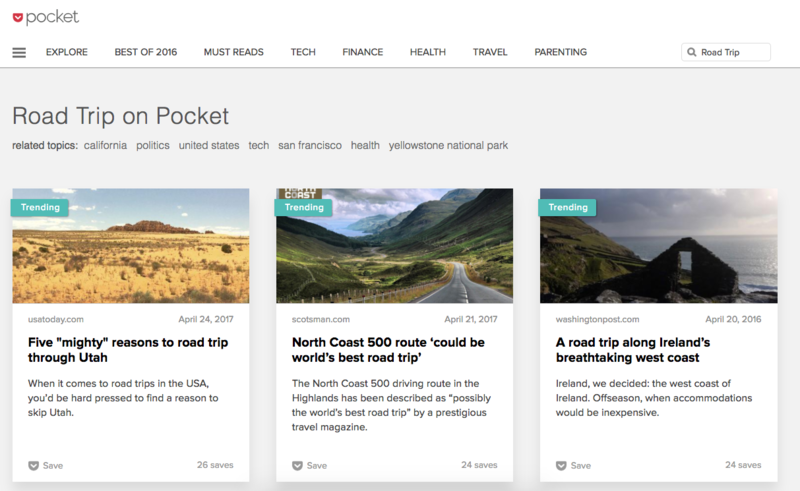 Pocket Explore is a great way to discover articles and videos about topics you’re interested in. To start brainstorming for a trip, try searching for terms like “London”, “Hawaii Travel” or “Road Trip”. During your trip planning, you can save restaurant reviews, city guides, and blogs with advice and tips for your journey. While you’re compiling an itinerary, keep your saves organized with a Tag. Click or tap the Tag icon and decide on a Tag name for your trip. You can add Tags when saving an item, or later when you’re viewing it in Pocket. 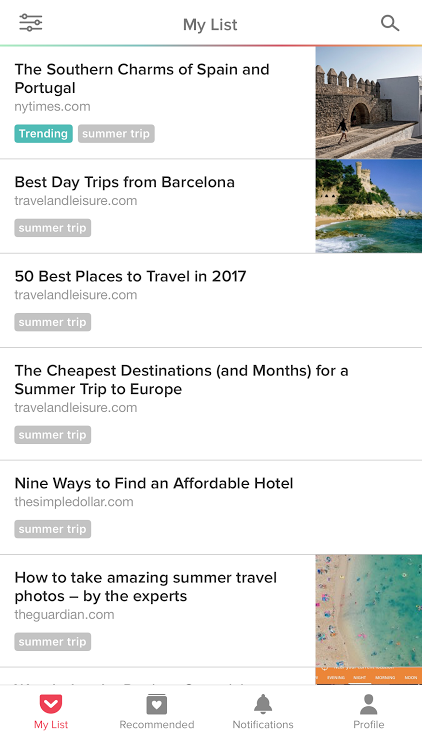 One of Pocket’s core features is the ability to access your saved pages when offline. It’s the perfect travel companion for keeping important travel tips handy. Whether you’re online or out of cellular range, simply open the Pocket app on your phone or tablet. Your travel guides, blogs, and other pages will be available when you’re on a flight, subway ride, or anywhere else without a connection. Plus, since roaming cellular data can be very expensive, using Pocket is key when you’re looking to use as little mobile data as possible during a trip abroad. Tip: Pocket is an essential for flight delays, long lines, and long train rides. This is a great opportunity to dig deep in your List and rediscover something great that you’ve saved a while ago. If you can’t look at a screen, Listen (TTS) will read articles to you out loud so you can catch up on your reading list at the gym, walking the dog, while doing the dishes, or anything else where your eyes might be occupied. Have you used to Pocket to plan an adventure? We’d love to hear from you! Please click here to let us know how you use Pocket when you travel. Bon Voyage!